The Ottawa Paramedic Service Headquarters (OPSH), designed by Griffiths Rankin Cook Architects, was the first LEED-certified project in Ottawa. Optimized to be 30 per cent better than the Model National Energy Code for Buildings (MNECB), the project features occupant-controlled temperature, natural ventilation, and daylighting. Photo courtesy GRC Architects Inc. 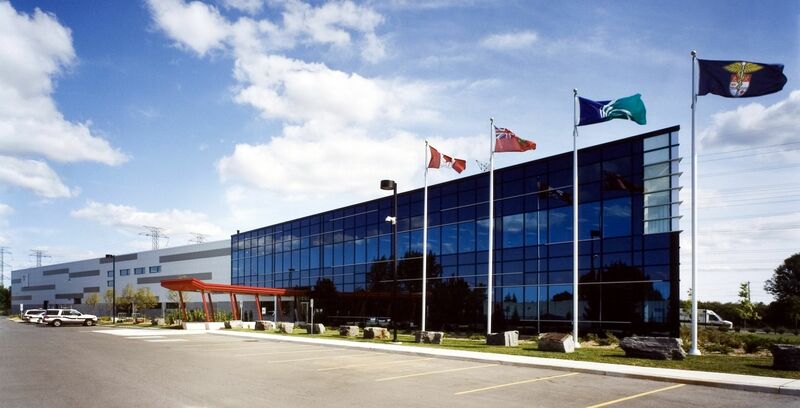 The Ottawa Paramedic Service Headquarters (OSPH) is the first Leadership in Energy and Environmental Design (LEED)-certified facility in Ottawa. It is also the first and only headquarters for paramedic services in the National capital region. The 9290-m2 (100,000 sf), two-storey, state-of-the-art facility consolidated staff and operations from different locations of the city. The design of program requirements, architectural character, and sustainable design were integrated as a holistic approach. The energy-efficient glazing system yielded an excellent solar co-efficient. The quality and esthetics of the glass also contributed to the overall corporate identity expressed in the architecture of the building. The high-speed garage doors benefit the daily operation as well as significantly reduce loss of heated or cooled air from the building. diversion of 75 per cent of construction waste from landfills. Owner: Forum Leasehold Partners Inc.
To read a case study about the Vancouver Convention Centre West, click here.